Menulog delivers for ThaiPhoon so you'll be able to track your courier on a map. Deep fry bean curds served with peanut sauce. Spring Roll, Curry Puff, Chicken Wings & Prawns Got Dressed. King prawn fritter with shredded coconut served with plum sauce. Deep fry squid served with sweet chilli sauce. Stir fried mix green vegetable with garlic & oyster sauce. Hot curry paste & vegetables. No coconut milk. With chicken, Thai white noodles, yellow curry, bean sprouts, shallots, egg, oyster sauce & soy sauce. Deep fried chicken with chilli sauce & steam vegetable with crispy basil. Hoisin sauce, fresh chilli oyster sauce, sugar, brown onion, shallot, mushroom & capsicum. Deep fry king prawn served with steamed vegetables & honey lemon. Ling fillet cooked with tamarind sauce, capsicum, shallot, mushroom & dry onion. Steam barramundi fish with lemon juice, chilli & coriander. Chilli jam & cashew nut stir fry with vegetables. Fresh chilli & Thai basil stir fry with baby corn, bamboo shoot, green beans & mushrooms. A slightly sweet & peanut flavoured stir fry with vegetables. Garlic & pepper marinade with baby corn, mushroom, pumpkin & shallots. Stir fried ginger with capsicum, carrot, broccoli, mushroom & shallots. Thai green curry with coconut milk, zucchini, eggplant, green beans, bamboo shoot & sweet basil. Thai red curry with coconut milk zucchini, eggplant, green beans, pumpkin & sweet basil. Thai panang curry with coconut milk, zucchini, green beans, pumpkin & sweet basil. A mild, slightly sweet traditional Thai curry with coconut milk, potatoes & roasted peanuts. Rice steak noodles stir fried with bean sprouts, garlic chives, eggs & crushed peanuts. Thick rice noodles stir fried with Chinese broccoli, egg & sweet soy sauce. 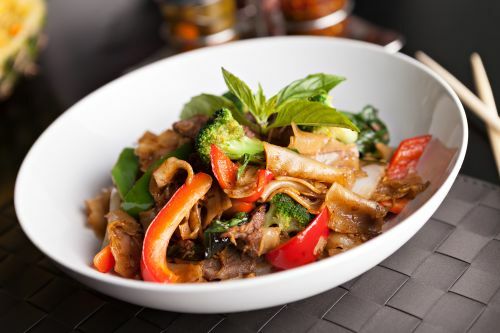 Thick rice noodles stir fried with mushrooms, egg, baby corn, pumpkin, bamboo shoot, fresh chilli Thai & fried rice dishes. Thinly sliced beef served with fresh garden vegetables, our authentic Thai chilli & zesty lemon dressing. Glass noodles served with garden vegetables, lemon juice, fresh chilli spinach onions & mixed salad. Minced chicken cooked with lemon juice, chilli flakes & Thai herbs. Fresh chicken breast marinated in Thai style sauce served with a mixed salad. A zesty king prawn salad with chilli jam sauce. Grilled duck breast in chilli jam, lemon juice & Thai herb on top with coconut cream & cashew nut. A mild spices, sour soup made with chicken, mushroom, coconut milk, coriander & lemongrass. Thai style soup with coriander, garlic, chicken & vegetable. A mild spices, sour soup made with prawns, tomato, mushrooms, baby corn, lemongrass, kaffir leaves, lime juice, coriander & crushed chilli.